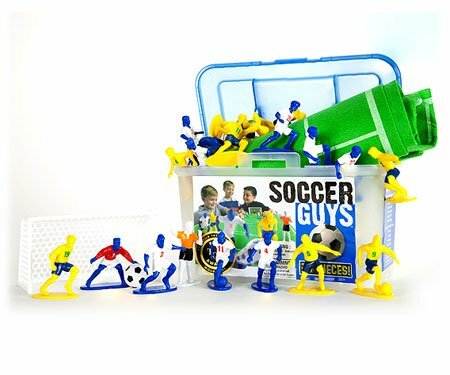 Kick fun into action with your own set of Soccer Guys! Twenty-four two-inch players, plus a referee, are all ready to turn your playroom into a world-cup stadium. Flip through the detailed instruction booklet to learn exactly how the game of soccer really works. Kick-off, offense, defense, attacking strategy, no hands, scoring, and more - Everything's explained in simple, easy-to-follow terms. Recreate the formations depicted in the instructions using the figures and then start playing your perfect game. - You don't have to go outside or turn on the T.V. 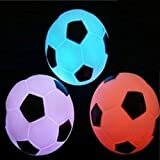 to enjoy amazing soccer! There's even a two-inch soccer ball for the players to actually kick around! But this is only the beginning. With Soccer Guys, there aren't any real rules that children absolutely have to follow. Which means however they play and however they use the figures is entirely up to them. Stories, adventures, new kinds of rules, new kinds of sports scenes, even using the figures as decorations on a cake - There's no end to the ways you can use these dudes! And don't forget - Once you're finished playing, everything easily packs up in the sturdy plastic storage container for quick and easy on-the-go fun. Whether you're a kid brimming with imagination, a coach looking for a new way to teach, or just a sports fan looking for a fun way to reenact the big game, Soccer Guys is exactly what you need.